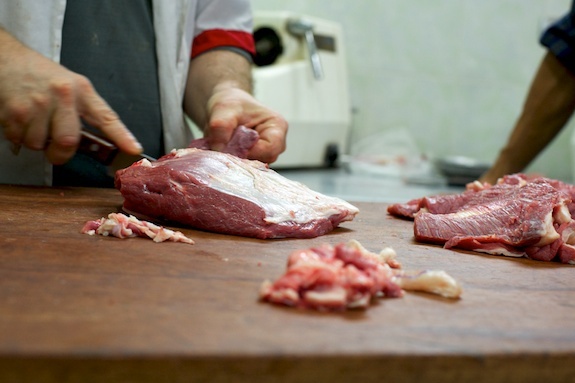 Disclaimer: If you are squeamish about meat, this post is probably not for you. A few weeks ago I made my first trip to an authentic butcher shop. The real deal; the kind with massive meat carcasses hanging in a cooler and a collection of knives that look like they belong in the set of a horror film. It was awesome (in the culinary sense); a-kid-in-a-candy-store experience. I had my DSLR around my neck and a grin that stretched from ear to ear. On my first trip to the butcher I tagged along with my grandmother’s sister (aunt, from here on out) and our neighbor. 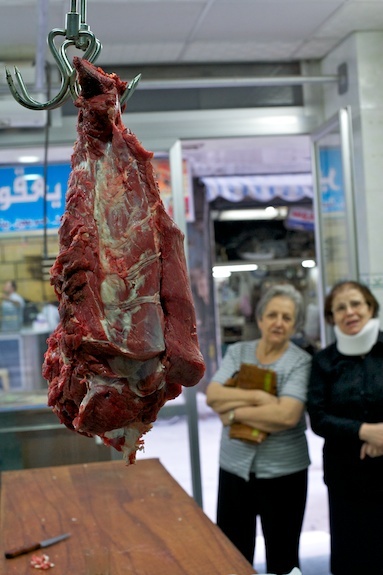 Before we left the house, my aunt made a phone call to Yasser, the butcher, to let him know we’re on our way. The phone call was short and ordinary; the kind you would have with a good friend or relative to let them know you’ll be swinging by later. Our neighbor met us downstairs and the three of us got into a taxi and headed to the Meedan distric of Aleppo (approximately a 5-minute cab ride from where we live). On the ride there my aunt explained to me how Yasser has been the family butcher for the past ten years. Yasser, she said, used to have his shop down the street from where she lived until he relocated to the Meedan district about three years ago. She reminisced about the days when she used to walk a few steps to his shop from her apartment. Despite the number of butchers that surround her neighborhood, she told me almost all of Yasser’s customers followed him to the Meedan district and, to this day, continue to buy their meat from him. Once we reached the center of the Meedan district, my aunt began to guide the driver through a maze of narrow roads called haras (حارة). These are roads that have been preserved from the olden days, before there were cars. Taxi drivers here are experts at swooshing through these slim passages. After a couple of these turns, my aunt signaled the driver to stop. As the taxi driver disappeared into the distance, I walked onto the sidewalk and followed my aunt and our neighbor into the butcher shop. The shop is small, maybe the size of a two-car garage, but not bigger. Yasser and his assistant, Ismail, looked up from their work and greeted us like family. There were two ladies sitting by the entrance as we walked in, waiting for their meat. Nothing here is pre-ground or pre-sliced, Yasser explained. All the meat is prepared to order. 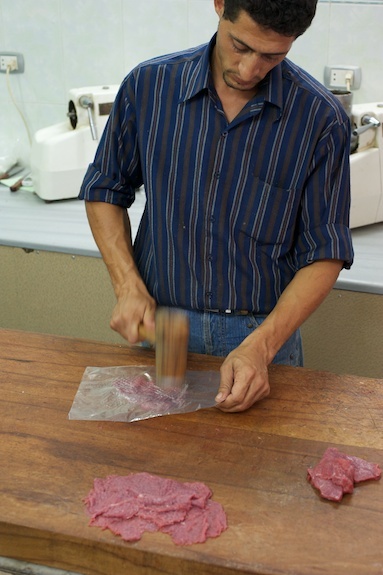 Yasser is not only a seasoned butcher, but also knows a lot about cooking, too. 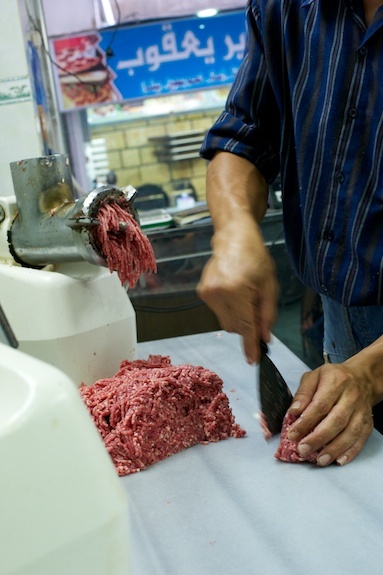 Take ground beef, for instance; depending on what you want to prepare, Yasser knows how many times to pass the meat through the meat grinder and how much fat to grind with the meat. He’s amazing. Now that I learned the way to Yasser’s shop, I’ve become a regular. Whenever I go, I am welcomed like family. Yasser and Ismail offer me coffee and tea and ask me about my research and stay in Aleppo. They’ve already invited me to their slaughterhouse, if I’m interested, but that will have to be for another blog post. 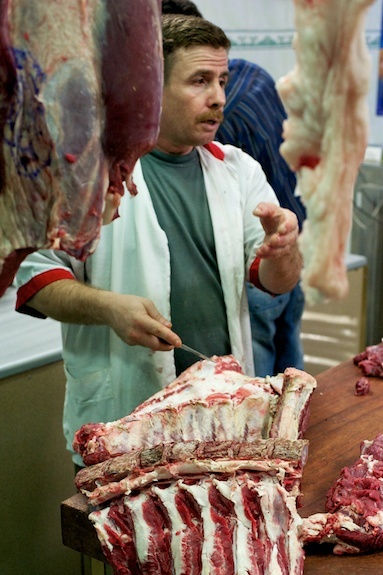 The reason I decided to write about my trip to the butcher is not to gross people out or have PETA boycott my website. Quite the opposite. 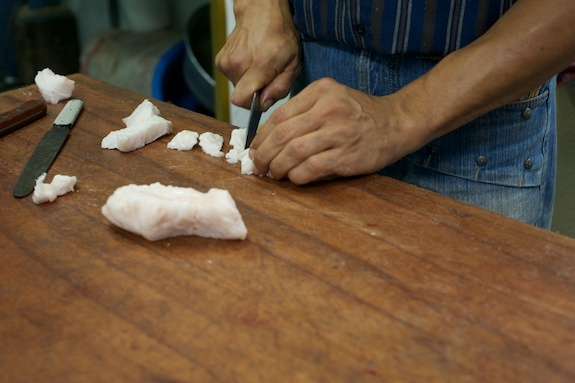 This trip to Yasser’s shop shows an important, and often overlooked, aspect of cooking. It reflects the connection that locals have to their food and where it comes from. More importantly, it highlights the foundation of a rich food culture that is built on quality ingredients and positive relationships. Note: I have a backlog of blog entries that I plan to post real, real soon. Thank you for all the wonderful emails and comments on my blog. I’m having an amazing time in Syria and I’m glad I have the opportunity to share it with everyone through my blog. If you would like to follow me through other channels, I post photos and updates regularly on my Facebook page and Twitter. Posted in Fulbright by Antonio Tahhan on November 30th, 2010. You can follow any responses to this entry through the RSS 2.0 feed. You can leave a response, or trackback from your own site. Although I don’t live in Syria, it’s only 2 hours from where I am and with all honesty I can say they have the BEST meat I’ve ever tasted. Syrians are famous in the Middle East for their home cooked meals and I think the superior ingredients they have play a big role. Every meat dish is succulent and full of flavor. After reading this post I can only wish we all had a “Yasser” in our neighborhood! the guy in blue is hawt!! Nice post tony , I noticed you have not blogged much after you moved to Syria, I noticed you butcher was not wearing gloves and God forbid you ask him to wear one. 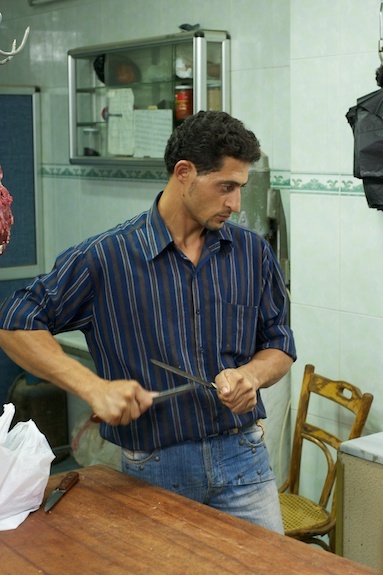 when I lived in syria the butchers will refuse to give me a lean meat, even when I offered more money, they are also not as trusted professionals as you will like to have from somebody handling your food. I hope that is changing.